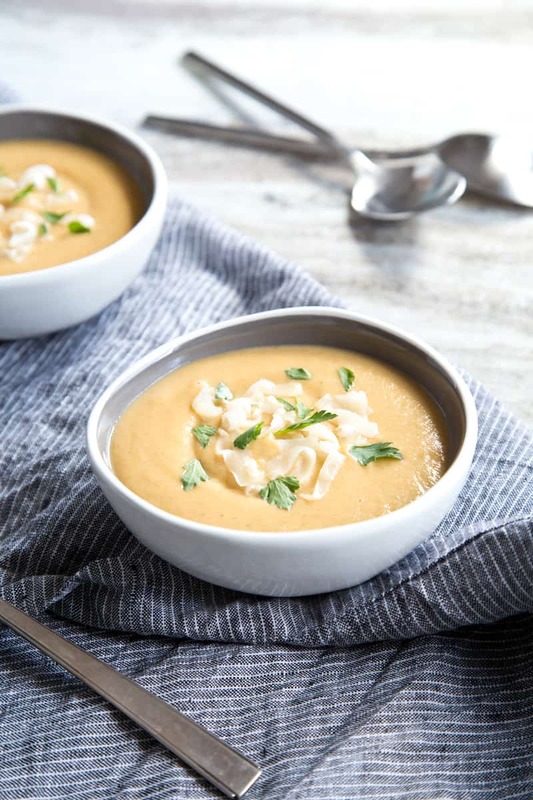 Parsnip Apple Soup (Vegan or Vegetarian) | Good. Food. Stories. Nothing’s more comforting than cuddling up with a warm, hearty stew or thick soup on a cold winter day. But once New Year’s comes, damn it, I’m also ready to start thinking about foods with a breath of spring! Call it aspirational. A meal that really delivers on both fronts? Puréed veggie soup. I’m something of a Goldilocks about soups—either they’re too watery to be satisfying, or too heavy with cream. Too bland to bother with, or tasty but blah after a few bites. But puréed veggie soups are just right. They provide all the warmth and comfort needed to get us through the last push of winter, and they also offer up a lightness, a freshness, and a variability that portends spring. You can easily make these soups as thick as the chunkiest stew or as light as a velvety bisque. They’re as good cold as they are hot, can be as simple or as complicated as you want to make them, and—once you have the formula down—the flavor combinations are infinite. This autumn, I had dinner at Café Amelie, a beautiful courtyard restaurant in New Orleans, with my parents. When the waiter told us the soup of the day was parsnip apple soup, my father was not impressed. “Parsnip and apple?” he said, like it was absurd. “Do you even know what a parsnip tastes like?” my mother asked, and he conceded that he probably did not. But the second I heard the description, I knew it would be fantastic. How had I never thought of this combination? I talked my father into ordering the soup despite his misgivings and he loved it (as I suspected), even if he still couldn’t make out which flavor was the parsnip (as I suspected). The thing I liked best about the parsnip apple soup was how unapologetic it was about its sweetness, the parsnip’s deeper and more earthy, the apple’s lighter and sharper. A little cream balanced the sweetness, and a drizzle of walnut oil grounded it and brought out the warmth of the parsnip. This soup isn’t an attempt to replicate that one, but it does build on its lesson about the balance of sweet and earthy. If you want a quick, perky soup, you can pull this one together quickly and leave it bubbling away on the stove. If you have a few more minutes to devote, though, I love to roast the parsnips (and a little potato) to bring out a bit of their darker sweetness. 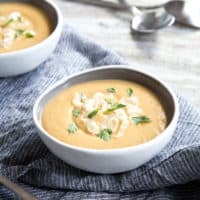 Instead of walnut oil, I’ve finished this soup with a gorgeous, creamy, lightly smoked Cheddar. You can grate it directly into the bowl and let it soften into the warm soup, or you could melt it on some bits of toasted bread and dip them into the soup. By the same principle, this would make an excellent soup to have alongside a grilled cheese sandwich. For a brighter finish, keep back a bit of raw apple and chop it for garnish. If you like the idea of adding some crunch to the bowl, throw a few extra parsnips into your grocery cart to make some quick oven-baked parsnip chips. Parsnip apple soup comes together quickly with an appealing earthy-sweet taste. It's ideal for vegetarians and vegans who want a hearty soup. Preheat the oven to 425 degrees F and line a baking sheet with parchment paper or a silicone liner. Toss the parsnips and potato with a little olive oil and pinches of salt and pepper. Roast for 20-25 minutes, or until the vegetables begin to get some color. Remove any small pieces of parsnip that start to brown as you see them, so they don't burn before the rest are done. Heat the butter or oil in a medium (3-4 quart) pot over medium heat. Stir in the shallot and cook for 3-4 minutes until softened. Add the garlic and cook 1 minute more, stirring to avoid burning the garlic. Stir in the coriander, tarragon, chili powder or smoked paprika, salt, and pepper. Stir in the apples, parsnips, and potatoes (whether raw or roasted), along with the broth or water and bouillon. Bring to a boil, then decrease the heat to medium-low and simmer until all fruit and veg are softened (between 20 and 30 minutes, depending on the size you cut them and whether you roasted them). 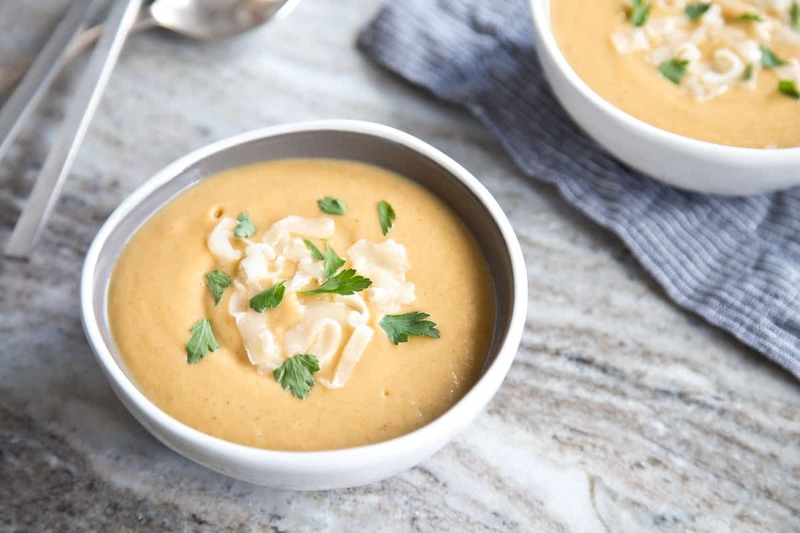 Carefully transfer to a blender or use an immersion blender to puree the soup to your desired consistency. If you want to stop here, your soup will be great (and vegan, if you used oil)! If you want a bit of added creaminess, stir in cream, crème fraîche, or yogurt. Finish with any and all of the optional garnishes suggested, or experiment with your own favorite toppings.